Comments: Battle as Obi-Wan or one of General Grievous’ bodyguards, as they face each other on the sinkhole planet Utapau! One remains—the other falls! Connect the battle arenas and let the battle be joined! 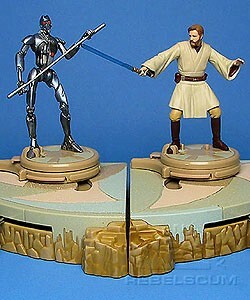 Special, poseable Revenge of the Sith action figures recreate the awesome thrill of Jedi battle! Place them on the platform, slide and turn the levers, and watch the dueling commence! For the ultimate battle, connect the bodyguard’s and Obi-Wan’s platforms with two other battle platforms (sold separately) for four times the Jedi excitement!